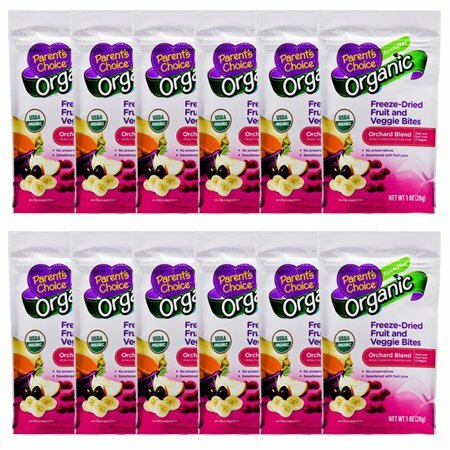 Parent's Choice Organic Freeze-Dried Fruit and Veggie Bites will help toddlers learn the fine-motor skills to eat by themselves. This delicious Orchard Blend of real fruit and veggies is freeze-dried to ensure they retain essential nutrients and freshness. They are USDA-certified organic, contain no preservatives, and are lightly sweetened with natural fruit juice. Our Bites come in a convenient, toddler-sized bag that is great for little hands and has a resealable opening to stop messes if they should occur. Introduce new flavors and textures in a healthy way while teaching your toddler some important skills with Parents Choice Organic Freeze-Dried Fruit and Veggie Bites.